Thermotolerant lignocellulolytic enzymes have become a subject of interest in industrial processes due to their ability to degrade lignocellulosic polysaccharides. Development of cost-effective, large-scale screening for production of desirable enzymes by thermophilic fungi is a challenge. The present investigation focused on isolating, screening, and identifying industrially relevant thermophilic producers of lignocellulolytic enzymes from various locations in the Warangal district, Telangana, India. Fifteen thermophilic fungi were isolated from soil on their ability to grow at 50 °C and were screened for their activity of cellulase, hemicellulase, and lignin degradation based on holo zone around colonies. 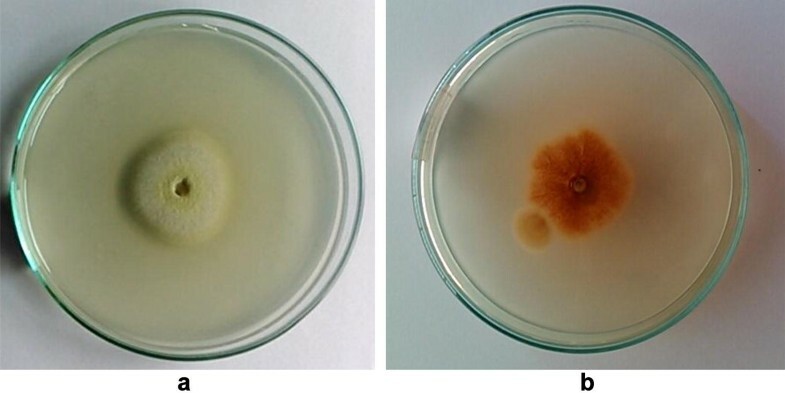 The appearance of the black color zone of diffusion in esculin agar is a positive indication for the β-glucosidases activity test. Out of fifteen isolates, Aspergillus fumigatus JCM 10253 have shown as a potential producer of extracellular enzymes for lignocelluloses degradation showing higher activity for cellulase (EI 1.50) as well as β-glucosidase (4 mg/mL), simultaneously for xylanase (EI 1.18) by plate assay methods. A. fumigatus JCM 10253 was selected for extracellular hydrolytic enzymes production under solid-state fermentation. Maximum CMCase (26.2 IU/mL), FPase (18.2 IU/mL), β-glucosidase (0.87 IU/mL), and xylanase (2.6 IU/mL) activities were obtained after incubation time of 144 h at 50 °C. The thermostability of crude cellulase showed the optimum activity at 60 °C and for FPase, β-glucosidase, and xylanase at 50 °C which recommended that the enzymes have a potentially significant role in the biofuel industries. The high titer production of active enzymes that cleave different β-1,4-glycosidic bonds still remains a challenge and is the major bottleneck for the lignocellulosic conversion. In particular, the finding of thermostable enzymes which would allow the development of more robust processes is a major goal in this field. Increasing global energy needs and greenhouse gas emissions have had a significant impact on ecosystem stability and the environment. Therefore, there is a need to find alternative sources of energy to replace existing fossil fuel resources. The conversion of lignocellulosic biomass into material for the production of biofuels is a potential alternative energy source with several advantages (Arora et al. 2015). Lignocellulose, composed mainly of cellulose, hemicelluloses, and lignin, is the main component of the plant cell wall (Lynd et al. 2002). Lignocellulose has a complex molecular structure, which blocks enzymes and thus, prevents the degradation of the biomass into fermentable sugars. However, producing sustainable biofuels from lignocellulosic biomass in a cost-effective way is a significant challenge in the commercialization of the production process (Behera et al. 2014). Additionally, chemical hydrolysis of lignocelluloses results in the formation of toxic components that are hazardous to the environment. Microbes are known to produce enzyme complexes that degrade plant biomass, offering an efficient and cost-effective alternative (Behera et al. 2013). Cellulose is a linear polymer chain of repeating units of cellobiose joined by β-1,4 linkages. Cellulose chains interact with each other via hydrogen bonds, resulting in the formation of a rigid, insoluble crystalline structure (Yamada et al. 2013). Three specific enzymes act synergistically to degrade cellulose into glucose, including endoglucanase (EC 3.2.1.4), exoglucanase (EC 3.2.1.91), and β-glucosidase (EC 3.2.1.21) (Garvey et al. 2013; Juturu and Wu 2014). Endoglucanase cleaves cellulose fibers into small fragments, releasing free reducing and non-reducing ends. Exoglucanase acts on non-reducing ends to release small cellobiose oligosaccharides. Finally, β-glucosidase converts cellobiose into monomeric sugars (Singhania et al. 2013). β-Glucosidases is a rate-limiting factor in the process of converting cellulose to glucose for bioethanol production. In the absence of β-glucosidase activity, cellobiose oligosaccharides accumulate, causing end-product inhibition and limiting hydrolysis yields (Suwannarangsee et al. 2012). Hence, commercially available cellulolytic preparations are usually added along with β-glucosidase to increase overall activity. Xylanases (EC 3.2.1.8) are a class of hydrolytic enzymes that can hydrolyze the polysaccharide 1,4-xylan found in hemicelluloses (Ramanjaneyulu et al. 2015). Since commercial processes require high temperatures, thermostable enzymes are necessary for industrial use. Therefore, there is an increasing demand for thermophilic and thermostable producers of cellulolytic and hemicellulolytic enzymes, particularly those that are resistant to product inhibition and highly stable (Arora et al. 2014; Mallerman et al. 2015). Recently, thermophilic fungal enzymes have become the subject of increased interest due to their ability to produce highly efficient, thermostable extracellular enzymes for plant biomass degradation at elevated temperatures. Degradation of lignocellulose by fungi is achieved by producing extracellular hydrolytic and oxidative ligninolytic enzymes. The hydrolytic enzymes cellulase and hemicellulase degrade polysaccharides into simple sugars, whereas ligninolytic ligninase enzymes degrade lignin and open phenyl rings (Sánchez 2009). Economically feasible enzyme production can be applied to the development of technologies that utilize cellulosic material as a renewable resource. 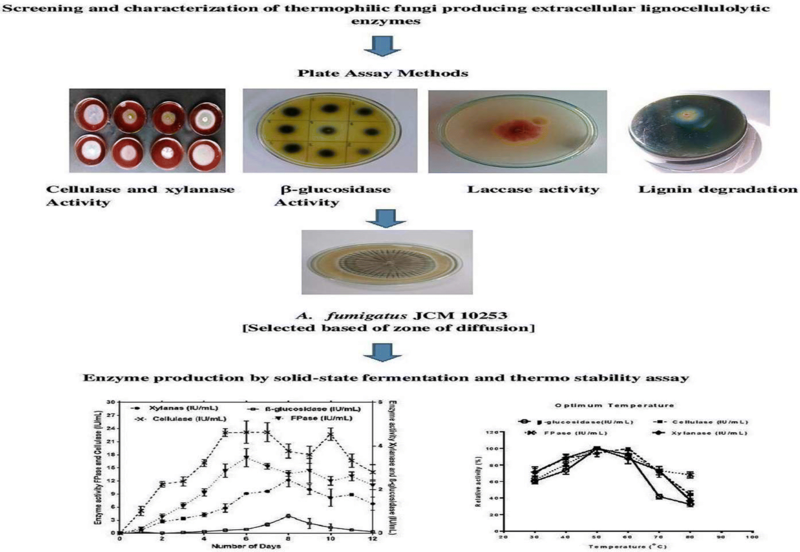 The main objective of the present study was to screen and characterize thermophilic fungal isolates based on their ability to produce extracellular lignocellulolytic enzymes and to degrade lignin and open phenyl rings, using plate assays. Based on the zone of inhibition, potential strains were selected for assessment of enzyme production using solid-state fermentation. Thermostability of respective enzymes was investigated. Warangal district is a part of the northern Telangana of newly formed Telangana State, India. It is situated approximately between the latitude of 17°19′ and 18°13′ North latitude of and 78°49′ and 80°43′ East latitudes. The soils of the Warangal city consist of sandy loams with patches of shallow black cotton soils and at places even medium and deep cotton soils. The weather of Warangal district is generally dry. Summers are hot sometimes, temperature reaches 50 °C. The temperature drops to 13 °C in winter seasons during the months of December and January (Narasimha Ramulu and Benarjee 2016). Soil samples were collected in sterile polythene bags from different sites in the Warangal district and were stored at 4 °C. Emerson Yeast Soluble Starch (YSS) agar media (4 g/L yeast extract, 15 g/L soluble starch, 1.0 g/L K2HPO4, 0.5 g/L MgSO4·7H2O, and 20 g/L agar, pH 7.0 ± 0.2) and malt extract agar (MEA) (20 g/L malt extract, 20 g/L dextrose, 6 g/L peptone, and 15 g/L agar) were used for fungal isolation experiments. Pure cultures were obtained by serial dilution. Inoculated agar plates were incubated at 30 °C and monitored at regular intervals for 10 days to assess fungal growth. Isolated fungi were sub-cultured on Emerson YSS agar slants and stored at 4 °C. A loopful spore of fungal strain was inoculated into Sabouraud Dextrose Broth (dextrose 20 g/L, peptone 10 g/L, pH 5.6 ± 0.2) for 7 days in the incubator shaker at 30 °C. To assess thermostability, isolated fungi were grown at temperatures between 30 and 50 °C. Fungi were inoculated at the center of the plate and radial growth patterns were monitored for 7 days. Based on the growth patterns at different temperatures, fifteen thermophilic fungi were selected for plate assays. Isolated thermophilic fungi were identified based on 18S rRNA sequence analyses performed by Gujarat State Biotechnology Mission, Department of Science and Technology, Gandhinagar, Gujarat, India. The growth of fungal isolates on MEA was taken as control. The inhibition index was calculated using the ratio of the diameter of the colony on CMC or xylan agar to the diameter of the colony on control agar (Khokhar et al. 2012). Each experiment was performed in triplicate. Esculin gel diffusion assay was used to assess β-glucosidase activity (Saqib and Whitney 2006). About 3% of agar in 0.2 M sodium acetate buffer of pH 5 was autoclaved and kept at 50 °C to avoid agar solidification. Esculin (0.2%) was mixed with 6 mL of 1% FeCl3 and heated to 50 °C in a water bath. Both solutions were mixed thoroughly and poured into 15-cm Petri dishes. The esculin agar was allowed to solidify and wells 0.4 cm in diameter were made. A total of 16 μL of fungal broth was pipetted into each well and the plates were sealed with Parafilm and incubated at 37 °C for 5 h. After incubation, the plates were transferred to an ice bath to slow down enzyme activity. Plates were assessed for the appearance of a dark zone indicating esculin hydrolysis. Each experiment was performed in triplicate. Thermophilic fungal isolates were screened for their ability to degrade lignin polymers using lignin (alkaline) as a substrate following the method described by Tekere et al. (2001). The reaction mixture contained 0.25% (w/v) lignin (alkaline), 5 g/L glucose, 5 g/L ammonium tartrate, 0.5 g/L MgSO4·H2O, 1 g/L malt extract, 0.01 g/L CaCl2·2H2O, 0.01 g/L FeCl3, 0.1 g/L NaCl, 1 mg/L thiamine, and 20 g/L agar and was autoclaved. Sterile lignin agar medium was poured into sterile Petri dishes and allowed to solidify. Wells 0.4 cm in diameter were made on the solidified agar plates. A total of 16 μL of test culture was pipetted into each well and the plates were sealed with Parafilm and incubated at 50 °C for 7 days. After 7 days, mycelia were scratched from the plate surface and flooded with a 1% FeCl3 and K3[Fe(CN)6] solution. The distance across each clearance zone, indicating degraded lignin, was measured. Thermophilic fungi were examined for their ability to produce laccase, which is involved in lignin degradation, using guaiacol agar medium (0.02% w/v guaiacol, 1% w/v yeast extract, and 2% w/v agar). A total of 16 μL of test culture was pipetted into each well and plates were incubated at 50 °C in the dark for 7 days to ensure adequate growth of cultures in the medium (Singh et al. 2013). Aspergillus fumigatus JCM 10253 was selected from the fifteen isolates as a potential producer of hydrolytic enzymes and used in further experiments. Mandels and Weber (1969) medium supplemented with 1% CMC or beechwood as a carbon source and 2.5% wheat bran as a substrate was used for shaking flask fermentation experiments. The medium was prepared as follows: 2 g/L KH2PO4, 0.3 g/L CaCl2·2H2O, 0.3 g/L urea, 0.3 g/L MgSO4·7H2O, 1.4 g/L (NH4)2SO4, 0.25 g/L peptone, 0.1 g/L yeast extract, 1 mL Tween-80, 0.005 g/L FeSO4·7H2O, 0.0016 g/L MnSO4·H2O, 0.0014 g/L ZnSO4·7H2O, and 0.002 g/L CoCl2·6H2O, pH 5. The prepared medium was sterilized at 121 °C, 15 psi. A loopful of spores of the isolated fungal strain A. fumigatus JCM 10253 was inoculated into the medium. Conical flasks were incubated at 50 °C with shaking at 160 rpm for 12 days. The extracellular total protein content of the culture filtrate was estimated using a Bradford assay (Bradford 1976). Carboxymethyl cellulase (CMCase) and filter paper activity (FPase) assay were performed according to the methods described by Ghose (1987). The assay for CMCase was carried out at 50 °C with a reaction mixture containing 0.5 mL crude enzyme and 0.5 mL of 2% substrate (CMC) dissolved in 50 mM sodium citrate buffer (pH 4.8) and incubated for 30 min. FPase activity was performed by incubating 0.5 mL of the crude enzyme with 1 mL 50 mM sodium citrate buffer (pH 4.8) containing Whatman No. 1 filter paper strip (1 cm × 6 cm) for 60 min at 50 °C. Xylanase assay was carried out according to the method described by Bailey et al. (1992). The activity was determined by incubating 0.2 mL of the crude enzyme with 1.8 mL of 1% beechwood dissolved in 50 mM sodium citrate buffer (pH 5.0) at 50 °C for 5 min. All the above reaction was stopped by adding 3 mL of 3,5-dinitrosalicylic acid (DNS) reagent and heating for 10 min in a boiling water bath. The amount of reducing sugar released was measured using a UV–visible spectrophotometer (Model: Jasco-V-630) at 540 nm. β-Glucosidase activity was analyzed using p-nitrophenyl-β-d-glucopyranoside as a substrate according to the method described by Grover et al. (1977). The reaction mixture consists of 1.4 mL of 0.1 M sodium acetate buffer (pH 5.0), 0.1 mL of crude enzyme with 0.5 mL of 0.02 M p-nitrophenyl-β-d-glucopyranoside (pNPG) and incubated for 15 min at 37 °C. The enzyme reaction was stopped by the addition of 2.0 mL 0.2 M sodium carbonate and absorbance was measured at 400 nm. Enzyme activity was measured in international units (IU) per mL. The amount of enzyme required to liberate 1 µmol of glucose, xylose, or p-nitrophenol from their respective substrates per min under the assay conditions was defined as 1 IU of enzyme activity (Kovács et al. 2009). 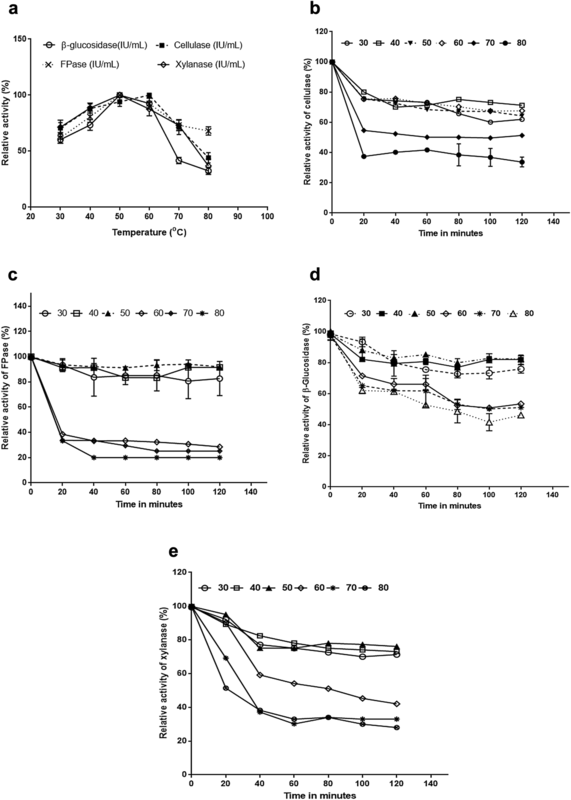 The effect of temperature on enzymes activity was determined by incubating crude enzyme at different temperatures ranging from 30 to 80 °C at the various time intervals. After incubation, the activity of the enzymes was determined by the standard assay as described earlier. In the current study, fifteen thermophilic fungi were isolated from soil based on their ability to grow at high temperatures. Fungal identification was performed using 18S rRNA sequencing (Table 1). Fifteen thermophilic fungal isolates from soil samples were screened for cellulase and xylanase activity on Czapek-Dox medium containing CMC or beechwood as a substrate. Cellulolytic fungal strains were selected based on the diameter of hydrolysis zones surrounding the colonies. Detection of extracellular hydrolytic enzyme activity was performed using qualitative evaluation of Congo red staining (Meddeb-Mouelhi et al. 2014). Cellulase and xylanase activities were measured using the enzyme activity index by measuring the clearance zone surrounding the colonies (Figs. 1, 2). Fungal isolates with high EI values were considered to be potential cellulase and xylanase producers. Of the fifteen isolated fungi, A. fumigatus JCM 10253 and Aspergillus terreus exhibited the highest cellulase activity with EI values of 1.50 and 1.24, respectively, followed by Aspergillus sp. (EI 1.13), Fusarium verticillioides (EI 1.11), and Eurotium rubrum (EI 1.09). However, the hydrolytic activity of other isolates, including Aspergillus caespitosus (EI 1.05), Aspergillus oryzae (EI 1.05), Rhizopus sp. (EI 1.05), Aspergillus nidulans (EI 1.03), Aspergillus nomius (EI 1.03), Fomitopsis africana (EI 1.03), Fomitopsis sp. (EI 1.03), Pleurotus pulmonarius (EI 1.03), Aspergillus flavus (EI 1.02), and Aspergillus ochraceus (EI 1.02), was relatively low. Moreover, none of the fungal isolates were resistant to CMC agar and the colony growth of fungal isolates on CMC agar was greater than that on control agar (Table 2). In agreement with these results, Aspergillus sp. has been reported to possess all of the necessary components of the cellulase enzyme system (de Vries and Visser 2001; Khokhar et al. 2012). The most efficient xylanase (endo-1,4-β-d-xylanohydrolase) producing strains were selected based on the size of the clearance zone surrounding the fungal colonies. A. fumigatus JCM 10253 (EI 1.18) and F. verticillioides (EI 1.09) exhibited the highest xylanase activities followed by E. rubrum (EI 1.08), F. africana (EI 1.08), Aspergillus sp. (EI 1.03), A. nomius (EI 1.03), P. pulmonarius (EI 1.03), and A. terreus (EI 1.02). Other isolated fungal strains, including A. oryzae (EI 1.01), A. caespitosus (EI 1.01), A. ochraceus (EI 1.01), A. nidulans (EI 1.01), A. flavus (EI 1.01), Fomitopsis sp. (EI 1.01) and Rhizopus sp. (EI 1.01) exhibited relatively low xylanase activity when grown on xylan agar. Moreover, the colony growth of all isolated fungal strains on xylan agar was found to be slightly higher than on control agar (Table 2). Hence, the fungal isolates were found non-resistant towards xylan agar, as the colony growth on xylan agar was slightly higher than control. The growth simulation/inhibition index was estimated by the ratio of the diameter of colonies on CMC or xylan agar to the diameter of the colonies on control agar. The index value represents the activity of each enzyme; an index value < 1 indicates substrate-inhibited fungal growth, whereas an index value > 1 indicates substrate-induced growth stimulation. Based on the inhibition indices for cellulase, the growth of A. fumigatus JCM 10253 (1.62), F. verticillioides (1.46), A. ochraceus (1.43) and Rhizopus sp. (1.42) was enhanced by CMC agar medium, whereas the effect of CMC agar medium was slightly reduced for the other isolates. On the other hand, based on the inhibition indices, the growth of the xylanase-producing fungal strains A. fumigatus JCM 10253 (1.34), A. terreus (1.32), A. ochraceus (1.26) and A. oryzae (1.25) was enhanced by xylan medium, whereas the effect of xylan was slightly reduced for the other isolates. The most commonly used microbes for the production of hydrolytic enzymes belong to the genera Aspergillus, Trichoderma, and Penicillium (Yadav 2017). Previous reports showed that soft rot fungi, such as Aspergillus niger and Trichoderma reesei (Xue et al. 2017), and the white rot fungus Phanerochaete chrysosporium produce large amounts of cellulase (Manavalan et al. 2015). A recent study showed that some of the white rot fungi are the most promising fungi in terms of biomass degradation and delignification because of their potential to synthesize cellulolytic, hemicellulolytic, and ligninolytic enzymes (Xu et al. 2018). Hydrolysis zone diameter was correlated with colony diameter on CMC and xylan agar media. However, the hydrolytic activity of all the isolates was found to be slightly higher. The hydrolytic activity of all isolates was found to be < 1. A. fumigatus JCM 10253 exhibited the highest hydrolytic activity, whereas the hydrolytic activity of the other isolates was slightly lower. The difference between isolates was statistically significant (p ≤ 0.05). The method used to screen for hydrolytic enzyme-producing fungi has previously been reported and found to be suitable (Abdel-Sater and El-Said 2001; Lalita and Prasher 2014; Bairagi 2016). Fungal isolates were deemed to be positive for β-glucosidase activity based on the appearance a black zone caused by the reaction between esculetin (6,7-dihydroxycoumarin) and ferric ion (Veena et al. 2011). Esculin is a glycoside, which is a naturally occurring sugar derivative. Glycosidase enzymes catalyze the hydrolysis of glycosides into sugars and non-sugars that can be used as a fuel resource for energy production. The presence of β-glucosidase causes the hydrolysis of esculin, producing a glucose molecule and the aglycone component esculetin. The non-sugar component aglycone can be used to assess the presence of glycosidase (Ford 2014), as it is the aglycone that reacts with ferric ions, resulting in the formation of a black chelate compound. Thus, the hydrolysis of the glycosidic bond by β-glycosidase via a hydrolytic reaction, resulting in the formation of an iron complex, is the key to the identification of enzyme activity. The reaction of esculetin with Fe+3 or ferric salts is a highly sensitive method due to the intensity of the color and the ease of identification (Edberg et al. 1985). The use of esculin with ferric chloride is a proven zymographic technique for the screening of β-glucosidase that is both cost-effective and gives distinct results (Kwon et al. 1994). In the present study, 16 μL of fungal culture filtrate was inoculated onto esculin agar plates and incubated at 37 °C for 5 h. Different incubation periods between 2 and 5 h did not result in any significant changes in the diameter of the zone of diffusion. Therefore, a 2-h incubation period is sufficient for the gel diffusion assay. The black zone of diffusion was compared to the standard curve of almond β-glucosidase (EC 3.2.1.21; activity ≥ 10U/mg solid; Fig. 3). Table 2 shows the fungal activity of the fifteen isolates determined by gel diffusion plate assays. The zone of diffusion was largest for A. fumigatus JCM 10253 (4 mg/mL; 1.5 cm) followed by F. africana and Fomitopsis sp. (2 mg/mL; 1.4 cm), P. pulmonarius (1.1 cm), A. ochraceus (1.0 cm), E. rubrum (0.6 cm), and A. caespitosus (0.5 cm). These results indicate that these fungi exhibit β-glucosidase activity and esculin hydrolysis. In contrast, no zone of diffusion was visible when A. nomius, Aspergillus sp., or F. verticillioides were inoculated on esculin gel. The absence of a black zone clearly indicates that these fungal strains do not have the ability to hydrolyze esculin. It has been previously reported that the diameter of the diffusion zone in a gel diffusion assay is proportional to the enzyme concentration (Wood et al. 1988; Saqib and Whitney 2006). Therefore, a standard curve of β-glucosidase was prepared on esculin gel to confirm this correlation. A lignin degradation plate assay was performed to assess clearance zones by staining the fungal agar plates with a 1% w/v aqueous solution of FeCl3 and K3[Fe(CN)6], as shown in Fig. 4. After staining, oxidized phenolic components appear blue–green with a clear zone around the colonies (Pointing 1999; Ali and Muid 2012). The clearance zone of lignin degradation for each of the fungal strains is shown in Table 3. A. ochraceus exhibited the largest clearance zone around the colonies (5.5 cm) followed by Rhizopus sp. (3.9 cm), F. africana (3.8 cm), F. verticillioides (3.5 cm), A. nomius (3.3 cm) and A. flavus (3.2 cm). P. pulmonarius and Fomitopsis sp. exhibited smaller clearance zones than the other isolates. Fungal isolates were further screened for their ability to secrete extracellular laccase using guaiacol as a phenolic substrate. Extracellular laccase is constitutively produced in small amounts by basidiomycete fungi, particularly wild-type strains of white rod fungi such as Pleurotus ostreatus (Hou et al. 2004), Funalia trogii (Birhanli and Yesilada 2006), and Trametes pubescens (Galhaup et al. 2002). The formation of a reddish brown color on solid media when guaiacol is used as the substrate is an indication of extracellular laccase production by filamentous fungi (Thurston 1994; Madhavi and Lele 2009). In this study, the appearance of a reddish brown color due to the redox reaction was used to indicate laccase secretion (Fig. 5). All isolates were shown to be positive and diameter of the zone was measured for their potential laccase activity, as shown in Table 3. The growth diameter of P. pulmonarius (4.5 cm), F. verticillioides (4.3 cm), and A. nomius (4.2 cm) was highest on guaiacol-containing agar plates. 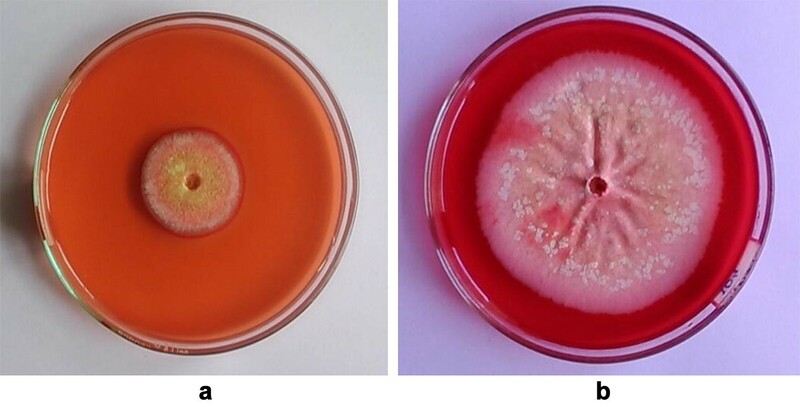 A. caespitosus, Aspergillus sp., and E. rubrum exhibited the lowest activity. The extracellular laccase formation observed in the present study is in agreement with previous studies of various fungal strains carried out by Revankar and Lele (2006) and Fu et al. (2013). Table 4 shows the qualitative assessment of lignocellulolytic enzymes produced by plate assay methods. Aspergillus fumigatus strain JCM 10253 was used for hydrolytic enzyme production by solid-state fermentation. Solid-state fermentation system provides an intrinsic state which is suitable for growing filamentous fungi to produce cellulases and xylanase (Singhania et al. 2010). In the present study, maximum CMCase (26.2 IU/mL) and FPase (18.2 IU/mL) activity was observed at 144 h, whereas maximum β-glucosidase (0.87 IU/mL) and xylanase (2.6 IU/mL) activity was observed after 192 h of incubation time at 50 °C (Fig. 6). However, in the present study, β-glucosidase activity remained relatively low and the longer incubation period caused a decline in enzyme production. This may be due to the depletion of nutrients or the spontaneous denaturation of the enzyme (Sandhya et al. 2005). Solid-state fermentation is a well-established technology for enzyme production and has various advantages, such as low costs of operation and the ability to use agro-industrial residues as the raw material (Raimbault 1998; Pandey et al. 2000; Adsul et al. 2014). Enzyme production also depends on various factors, such as chemical composition, accessibility, and the physiochemical links between the components of the substrate (Gao et al. 2008). Previous studies on Aspergillus sp. in the production of cellulase and hemicellulase as summarized in Table 5. In the present study, A. fumigatus strain JCM 10253 produced hydrolytic enzymes with higher activity as compared to previous studies. The maximum CMCase (26.2 IU/mL), FPase (18.2 IU/mL), β-glucosidase (0.87 IU/mL), and xylanase (2.6 IU/mL) activities were obtained. In previous reports, A. fumigatus SK1 showed CMCase (54.3 U/g), FPase (3.35 U/g), β-glucosidase (4.5 U/g) and xylanase (418.7 U/g) activities using oil palm trunk as a substrate (Ang et al. 2013). On the other hand, A. fumigatus SK1 cellulase activity was 1.4-fold higher compared to A. fumigatus MS16 and xylanase activity was 2.7-fold high as compared to A. niger MS80 (Sohail et al. 2009; Ang et al. 2013). Grigorevski-Lima et al. (2009) obtained 365 U L−1 activity of endoglucanase (CMCase) from A. fumigatus at temperature 65 °C and pH 2. It has been reported that Aspergillus sp. is categorized as intense xylanase producer (Polizeli et al. 2005; Sohail et al. 2009; Ibrahim 2008). Hence, A. fumigatus JCM 10253 showed higher xylanase activity as compared to A. niger MS 80. The activity of crude enzymes from A. fumigatus JCM 10253 was investigated at various temperatures ranging from 30 to 80 °C in an attempt to understand the effects of temperature on the enzyme activity. The temperature profile demonstrated the optimum temperature for CMCase, FPase, β-glucosidase, and xylanase. The CMCase showed optimum activity at 60 °C and FPase, β-glucosidase, and xylanase exhibited optimum activity at 50 °C as shown in Fig. 7a. Hence, declining in enzyme activity with the further increase in temperature could be due to denaturation by heat (Olajuyigbe et al. 2016). Figure 7b depicts the crude cellulase retained 80% of its initial activity in first 20 min of incubation at 60 °C, but this gradually decreased in the next 40 min, providing a maximum of 65–70% activity after 40 min. β-Glucosidase and FPase retained 80–90% of their activities in first 120 min of incubation at 40–50 °C. However, there was a decline in the activity at a higher temperature (Fig. 7c, d). 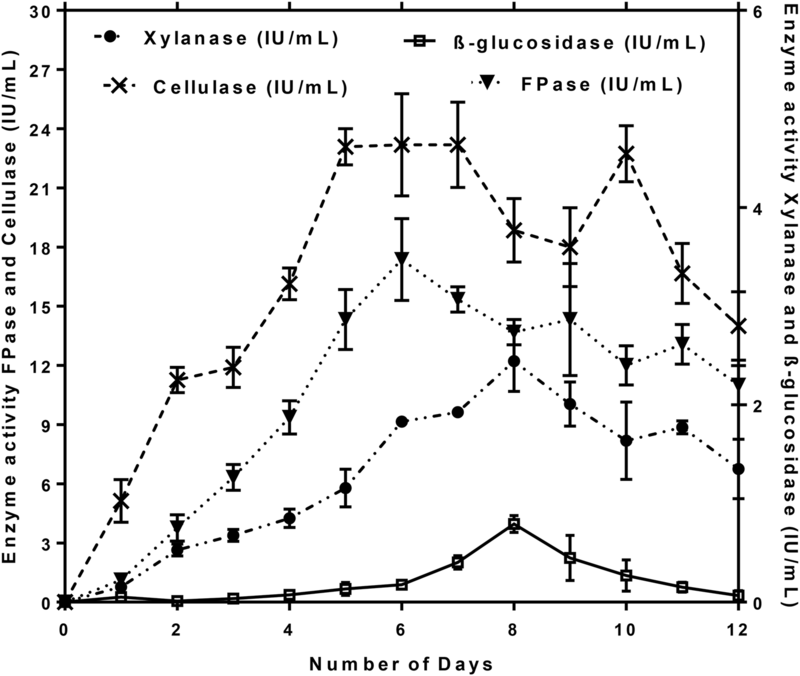 Xylanase enzyme retained about 95% activity of its initial activity in the first 20 min of incubation at 30–50 °C, whereas it decreases to 75% with the increase in the incubation time period. Increase in temperature showed lower stability retaining about 30–60% activity (Fig. 7e). Thermophilic fungi are known to produce industrially important lignocellulolytic enzymes which play a significant role in degradation processes of lignocellulosic biomass, municipal solid waste, and other organic waste. In the present study, fifteen thermophilic fungi were isolated from the soil and most of them belonged to the Aspergillus genus. A. fumigatus JCM 10253 showed high cellulase activity and simultaneous esculin and xylose hydrolysis in plate assays. This suggests that thermophilic fungus is a producer of extracellular enzymes via lignocellulosic biomass degradation. Maximum CMCase (26.2 IU/mL), FPase (18.2 IU/mL), β-glucosidase (0.87 IU/mL), and xylanase (2.6 IU/mL) activity was obtained after incubation time of 144 h at 50 °C under solid-state fermentation. The thermostability of crude cellulase and xylanase showed optimum activities at 60 and 50 °C, respectively. This study represents an approach to scaling up studies in a bioreactor for commercial production to solve the problems associated with the bioconversion of lignocellulosic biomass into biofuels by selecting highly efficient producers of extracellular hydrolytic and ligninase enzymes. PS performed the research experiments and wrote the manuscript. MP helped in the experiments and manuscript writing. KN guided both authors during the experiments and manuscript preparation. All authors read and approved the final manuscript. The authors acknowledge the support provided by the Department of Biotechnology, National Institute of Technology Warangal, Telangana, India.